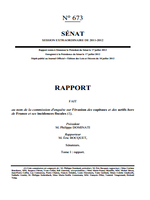 MEMOFIN - ESMA’s Report on the Supervision of Credit Rating Agencies - L'information financière que vous ne trouvez nulle part ailleurs ! ESMA today publishes a report (ESMA/2012/207) on the supervision of Credit Rating Agencies (CRAs) registered in the European Union (EU). The report provides an overview of ESMA's supervisory activity and summarises the results of the first examinations ESMA conducted in December 2011 of three groups of CRAs, namely Fitch Ratings (Fitch), Moody's Investor Services (Moody's) and Standard and Poor's Rating Services (S&P). Adequacy of resources devoted to internal control functions and analytical business lines. In light of its regulatory objective to protect investors and financial stability, ESMA decided to focus its first on-site-inspections on the larger CRAs. ESMA's examination aimed at monitoring compliance by CRAs with the EU Regulation, and focused in particular on three specific credit rating classes (sovereign ratings, bank ratings and covered bond ratings) which it considered to be significant, given the current market trends, the degree of credit linkage and the interdependence of these products. ESMA has not determined whether any of the observations in the report constitute a breach of the CRA Regulation. ESMA will follow-up on the observations through risk mitigation plans for each individual CRA in the first half of 2012.